Which came first? Swamp Thing or Man-Thing? 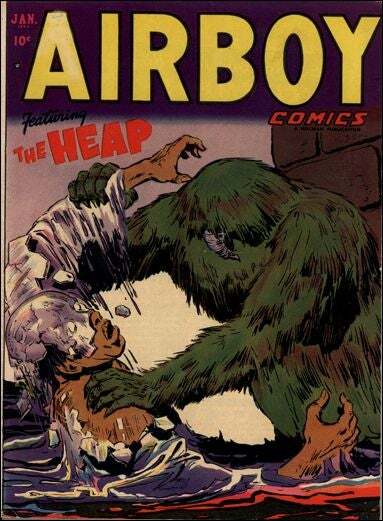 In a way this amounts to a trick question, because The Heap, which debuted in a 1942 edition of Airboy Comics, beat them both by thirty years. Evidently the comics have long had an affinity for anthropomorphic swamp monsters and, even in regard to their own signature sentient peat bogs, neither DC nor Marvel got the jump each other. While Marvel's Man-Thing appears to have had a two month edge on DC, first appearing in a May 1971 anthology called Savage Tales #1, Mark Engblom over at Comic Coverage argues that, in the world of comic publishing, this doesn't mean all that much. At this point, you might be thinking "Hey, Man-Thing beat Swamp Thing by a full two months!" Ah, but remember, in the comic book biz it typically takes three to four months to create and print a comic book from start to finish...so the two month gap between Savage Tales #1 and House of Secrets #92 tells us that DC wouldn't have had a prayer creating a Man-Thing knock-off in such a short period of time. The history of swamp men in comics is pretty interesting and Engblom's short and sweet article on the subject is a nice little overview of these marshy curiosities.